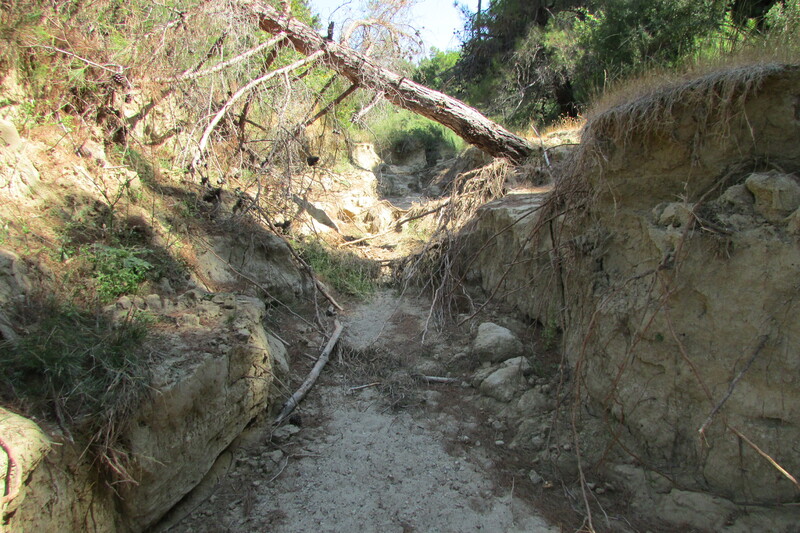 Over one hundred years after the end of the Gallipoli campaign, Gully Ravine is slowly covering its wounds and nature is reasserting its hold on this remote and unique place. At one time, a stone road ran alongside the stream bed, and the route to and from the front line was constantly busy. In some areas parts of this structure can still be discerned, but in others winter storms and the relentless progression of time has erased anything man-made. In places, the stream has scoured a new bed, sometimes five or ten feet below the banks on either side. Trees occasionally fall from the eroding slopes, and on every occasion that I have walked the gully I have had to climb over, under, or navigate around at least one, photo, above. Apart from the Turkish memorials at Nuri Yamut at the top end of the ravine, Gully Ravine is entirely untouched by later development. This is a place to visit soon, because in perhaps 20 – 30 years the trenches, the gully road and the evidence of human occupation will have faded away completely.